Earlier this year men from across the Anangu Pitjantjatjara Yankunytjatjara (APY) Lands came together for the first time to paint a large collaborative canvas. Each artist contributed to the canvas telling their own stories and helping each other complete the work, encapsulating their different Tjukurpa, Ngura (Country) as well as what it means to be keeping Anangu culture strong. 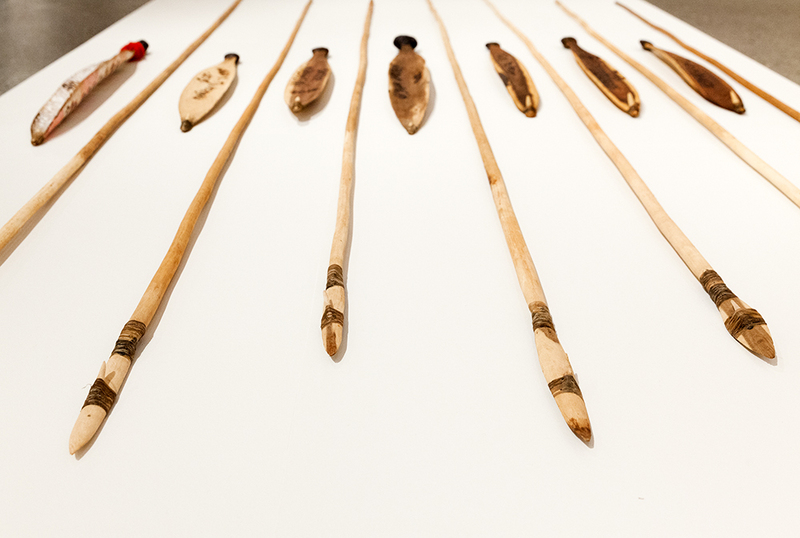 The painting and an installation of Kulata (spears) and Kulata Miru (spearthrowers)) are dedicated to Mr Ingkatji, a significant senior law man and artist from Pukatja who passed away this year. He was the watchman of our culture. He held the key and kept it safe. He was happy and kind to everyone he knew. He protected our stories and cared for our people, young and old. He was our teacher, he taught us all. The senior men of the APY lands dedicate this painting to our friend, brother, uncle, father, grandfather and a watchman of our culture, Kunmanara Ingkatji. We created this Kulata Tjuta installation in his memory and honor. Paluru kuwari paku wiyaringu.